A: Each family creates a family account by entering their email address and a password, adding children to their account, and then placing their order. A: You can easily retrieve your password by clicking forgot password the Login page. It will be sent to the family account email address in less than 1 minute. A: Easy. Once they have created the order for their first child they simply select “choose another child” and the system will take them back to the beginning of the order system. A: Effective January 2018, the hot lunch ordering system is being changed to a vendor that is able to provide secure, inexpensive credit card one time payment through "Stripe", hence no information is stored in the Stripe system. Q: Are payments made separately or by lump-sum? Q: How do I get a copy of my order? A: The ordering system sends an automated email which includes a copy of the order. Parents can also login to their account anytime and re-print their order/s. A: In addition to being able to re-print their order (as described above) parents will ALSO receive an automated email lunch reminder, the day before each lunch day! This reminder lists their child’s specific food items ordered. Q: Is the student and account information stored in the ordering system secure? A: Yes. Our site uses fully encrypted secured internet protocols (SSL) which is the same technology used by large corporations and banks. The data is housed in a secured datacenter and information is never shared with any 3rd party. Q: How can I be assured that my child(ren) will receive the correct order? A: The ordering system generates Class Distribution lists which includes each child’s name and order and the hot lunch coordinator will validate and assist if there are any student questions or concerns. All items are labeled with students name, division and item name. All items are sorted by division and gets delivered to the classroom. Q: What if happens if my child does not get what they ordered? Q: Why did the MPAC choose to switch ordering systems? Then Munchalunch was able to provide the the items above and a secure online credit card payment option we switch back. Munchalunch is used by all the other PAC is the district and is the preferred ordering system of our vendors. Q: Does the Online Ording system use “cookies”? A: Our vendor MunchaLunch does use "cookies" to "remember" log‐in details of users who enter information in the parent login section. A "cookie" is a text file that is placed on your hard drive by a web page server. Each time the browser requests a page from the server, this text is sent back. "Cookies" are not used to run programs or deliver viruses to your computer. "Cookies" are uniquely assigned to your computer, and can only be read by a web server in the domain that issued the cookie to you. If you are using a shared computer and have entered information in the parent login area, please ensure that you log out or close down the browser before leaving the computer for the next user. Q: Do you have gluten-free and soy-based choices? A: We have gluten-free entrée choices on most days. Look for items marked gluten-free or **. Also note your gluten-free preference under your Student Profile so that our vendors know to modify your child’s order. We do not offer gluten-free buns on hot dog day. Please direct questions regarding allergies to the Hot Lunch Coordinator and we will provide specific nutritional information as required. Q: Why don't you have more choices for children with allergies? A: We have worked hard to accommodate children with allergies. We ask that parents note these under your Student profile. This year, we have found vendors that are willing to work with us to make our hot lunch program as inclusive as we can. Q: What are the hot dogs made of? Why don't we have veggie wieners? Are the buns whole wheat? A: Our hot dogs are made of 100% all beef and 100% whole wheat buns. We will likely use Schneider’s again this year. Many taste tests over the years have brought this brand out on top and they have the best survival rate in the pot. This matters when cooking over 200 hot dogs in two pots! Ketchup and mustard are offered in class to dress hot dogs. This is the only product that we actually cook and serve ourselves in the school. Again, we do not offer a veggie dog option. Q: Is the sushi raw? A: We do not offer any raw fish or seafood options. The hot dishes are especially popular in the winter and the fried rice choice is easy for younger kids to eat. Q: Why are there no juice boxes? A: The BC Health Link Brand Name food list marks juice as “Do Not Sell” as of 2014-2015 and therefore we are unable to offer it in our Hot Lunch Program. We offer milk at most lunches. Q: Do you offer bottled water? A: Water is listed as “Choose Most” according to The BC Health Link Brand Name food list; however, the waste it produces does not align with our goal of being a GREEN school. We therefore ask parents to send reusable water bottles. Q: I would like to help with Hot Lunch. What does that look like? A: The program is totally volunteer-operated but actually does not require many people. The biggest day is hot dog day just because we make and package the food on site. Most of the positions are filled by returning volunteers but you can let us know days you are able to assist with Hot Lunch under the Volunteer Tab. There is lifting and bending required. The parent assists with distribution and is usually done by 11:55 am. If you are interested in doing this, please volunteer. We generally like a volunteer to do all of the pizza days, another person to do all of the sushi days etc., just so that they become familiar with the process and can do the job efficiently. Q. What do I do if my child is sick or we are going to be away? A: As you can imagine, this is a huge food order that we put together and submit to our vendors seven days in advance. Making menu changes increases the risk of error so we ask that you kindly consider missed food to be a donation. We give leftovers to the teachers, volunteers and office staff at the end of the lunch session. If your child is returning to school after being away in the morning and expects to have lunch, you must contact Mrs. Palgova before 11:00 am so that your child's lunch can be pulled and put in the fridge for them. We will not pull lunches from the bags at serving time so if you do not make the telephone cut-off, you must collect the food from the classroom. It is too busy at distribution time for our volunteers to be pulling lunches. We do not keep food around after lunch. We are all gone by 12:30 ish and it is not aligned food safe policies for us to leave unclaimed food on the counter. Q: Can I sample the food? Q: Do students bring home uneaten Hot Lunch? A: Primary children have to bring home all uneaten lunch so even though you did not send food, you should always look in the backpack in case something comes home. And hopefully it will be in a container! If your child is a slower or lighter eater, you may want to send a container for their leftovers in case the delivery container is not very sturdy. Q: How are the vendors chosen? A: The School District hosts an event called “Foods that Fit” which is open to all parents. Here, they invite vendors that meet the BC Health Link criteria for food that can be sold within schools. The Hot Lunch Coordinator &/or PAC member attends this event to taste-test, price and ask about delivery, packaging, labeling, availability and accommodation of food allergies. We look for vendors that will label items and pack per division. We also feel that if one of our school values is RESPECT, then Hot Lunch should try and respect those students with specific food requirements. Our goal is to make the program as inclusive as possible. Q: How is the menu chosen? A: The Hot Lunch Coordinator chooses items that meet the BC Health Link Guidelines which determine what food can be sold to students. 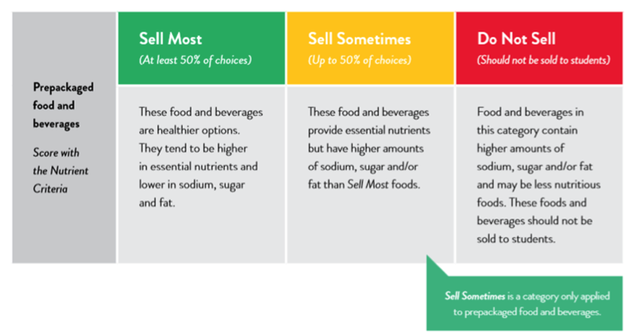 The regulations effective 2014-2015 require that 50% of the menu be from “Choose Most” category and the remainder be from the “Choose Sometimes” category. We are not able to sell items from the “Do Not Sell” list, which now includes juice boxes. The difficulty is that many of our entrée items are from the “Choose Sometimes” category. Therefore, starting 2014-2015 you will find that our treats are healthier options, and portion sizes are reduced. If we have not answered your question, please email info@montroyalpac.com.